Sterling Children's Books, 9781402797330, 32pp. 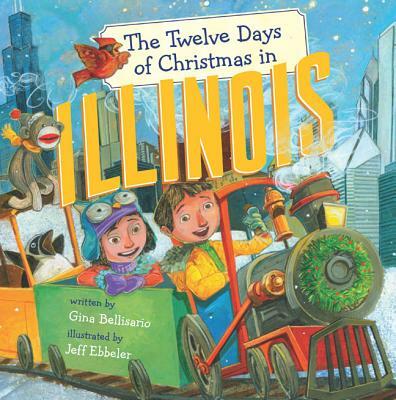 From sparkling boats on Lake Michigan to giant roadside statues along Route 66, Illinois has it all--and Mia's going to see everything the Prairie State has to offer when she visits her favorite cousin for Christmas. Along the way, she gets some great state gifts, including a chirpy red cardinal named Ruby, some spooky ghosts, and a whole gang of sock monkeys--invented in Illinois! Gina Bellisario and Illinois go together like mustard and a Chicago-style hot dog (hold the ketchup!). Her roots began in the Prairie State, where she now lives with her husband and twin daughters. Gina has much love for everything Illinois, but the landmark closest to her heart is the John Hancock Center. Her uncle George helped build the famous skyscraper! She even has a picture of him on top of "Big John." A print of the photograph is also in the Art Institute of Chicago. Visit Gina online at ginabellisario.com. Jeffrey Ebbeler has illustrated several children's books, including April Fool, Phyllis!, by Susanna Leonard Hill, and Cinco de Mouse-O!, by Judy Cox, both for Holiday House. He has created art for magazines, CD and book covers, and large-scale murals. He also has done paper engineering for pop-up books and sculpted puppets for several marionette theaters. He lives in Cincinnati, OH, with his wife and twin daughters. Learn more about him at jeffillustration.com.